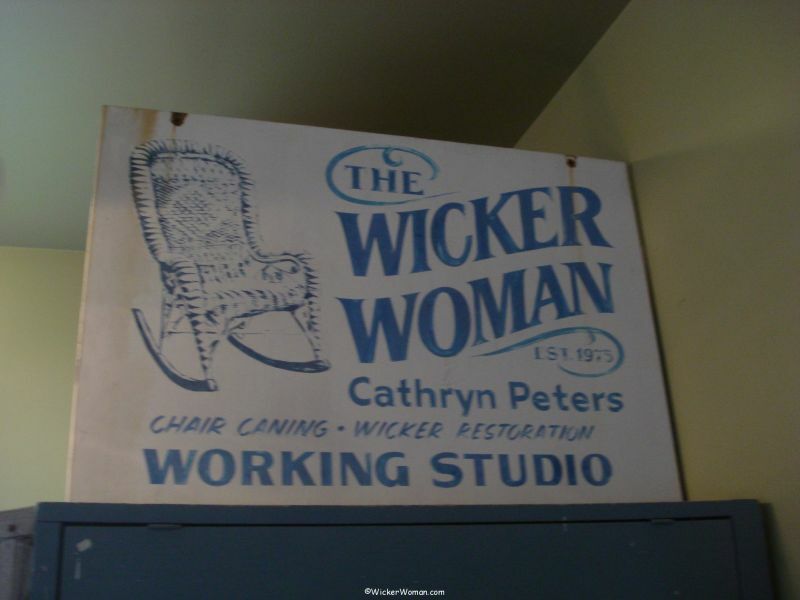 Here are the 2013 chair caning and wicker repair charges for The Wicker Woman® business located in northern Minnesota in Angora, 60 miles south of the Canadian border. You can use this pricing schedule as a guide for what typical charges you might expect in your area. But keep in mind that not everyone charges the same way I do and the pricing may vary drastically across the country. After working in this field for 40+ years, as of September 2013 I retired from the active day-to-day cane and wicker restoration work. I won’t be taking on any new projects for repair or restoration for clients. I am continuing with this website, teaching, demonstrating, lecturing, blogging and consulting. Check the National Furniture Repair Directory™ to find a pro near you to fix your furniture! 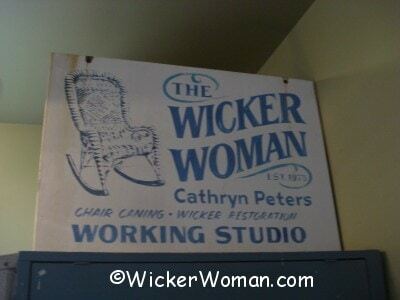 Thanks to all my loyal clients throughout these 40+ years, without you, I wouldn’t be The Wicker Woman®! Labor: $60.00 hour, plus materials. 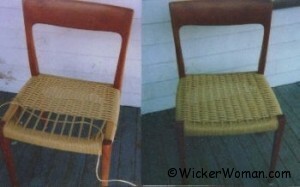 Both rattan reed and paper fibre wicker repairs are done, with special emphasis on Victorian reed wicker restoration. 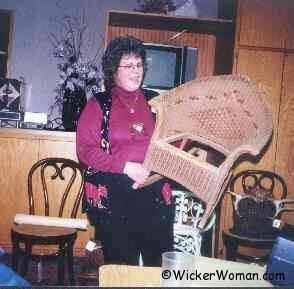 No “new” resin wicker or plastic wicker, however. Labor: $1.40/per drilled hole, plus materials ($20-$40). More than 72 holes: $1.45/per drilled hole, plus materials. 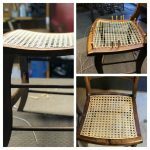 Holes are drilled around the perimeter of chair seat frame and individual strands of cane are hand woven through the series of drilled holes. or 35 cents per square inch, plus materials. 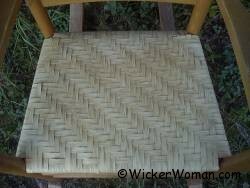 Prewoven sheet cane is set into a routed out groove on the top side of chair, held in place with a reed spline, no holes drilled in framework. Labor: $7.00 per inch, plus materials, longest rail ($20-$60). 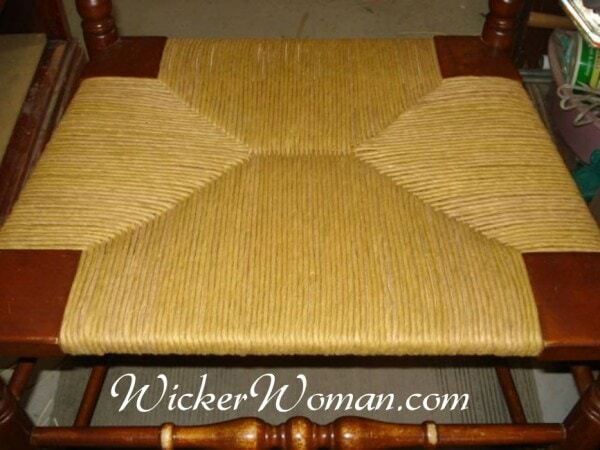 Two layer weave applied to both the top and bottom around seat rails, creating a pocket. 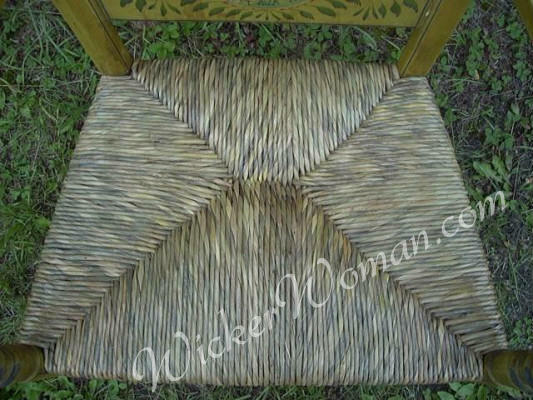 Frequently seen in seats and backs of porch rockers and is weather resistant, hence the name “Porch Cane.” Can also be done in Diamond Weave, Basket Weave, or Chevron. Labor: $3.00 a hole, plus materials ($20-$40). 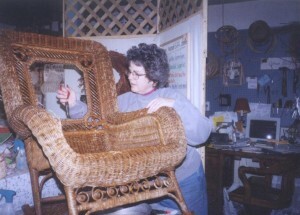 Very intricate and difficult hand cane weaves, using two different gauges of cane. 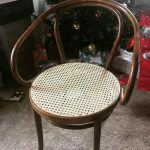 Not as sturdy as Traditional 7-Step Method of Hand Caning, so usually reserved for the backs and under arms of Victorian wicker furniture. Labor: $4.00 per drilled hole, plus materials. 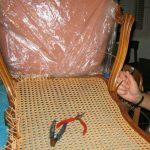 Extremely difficult and very time-consuming weaving technique. 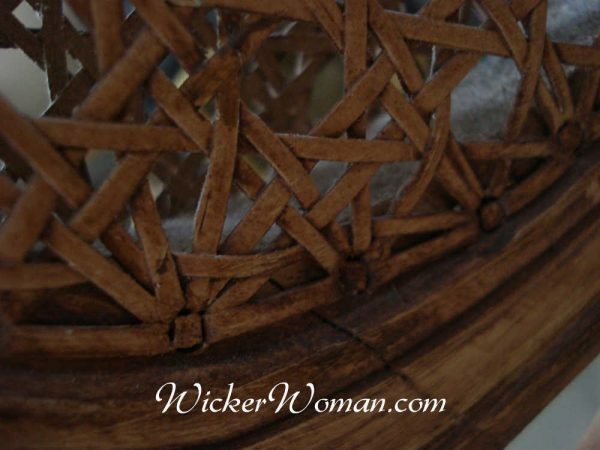 Blind Caning requires each strand to be measured exactly, cut to proper and exact length, and glued into holes only partly drilled through the framework. 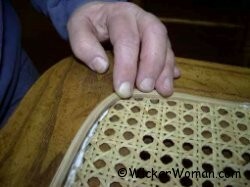 These holes are not drilled completely through the frame as are regular cane chair holes. Usually reserved for very fine high-end antique furniture or museum pieces. Labor: $5.00 per drilled hole, plus materials. Extremely difficult and very time-consuming weaving technique. Double Blind Caning requires each strand to be measured exactly, cut to proper and exact length and glued into holes only partly drilled through the framework, like the Blind Caning. 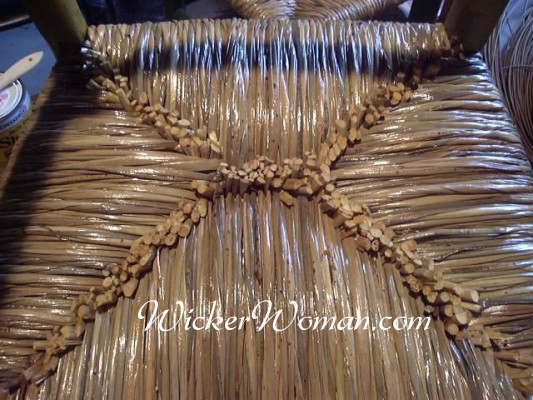 But the big exception being that the caning is done on both the front side of each panel in the frame and the back side of each panel of the frame. Almost always reserved for very fine high-end antique furniture. Labor: $20.00 per inch, includes materials, longest rail. 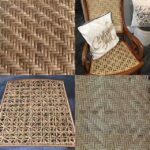 Extremely rare and very laborious type of hand-twisted weaving, using natural materials of either cattail leaves or bulrush. Usually reserved for museum pieces or high-end quality antiques. The market is currently being flooded with cheaply made imports, which would probably be best replaced using the less expensive pre-twisted seagrass rush instead of the hand-twisted rush. Labor: $6.25 per inch, plus materials, longest length rail. Labor: $5.25 per frontal inch, plus materials. Continuous strand, man-made paper material, forming distinct pattern of four large triangles, meeting in the center. Commonly found on post-1910s Colonial ladderback chairs. 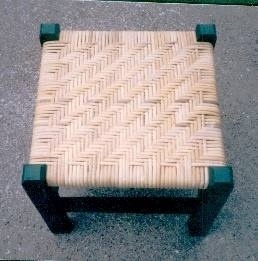 Sample photo of paper fibre rush footstool, used in my classes. Labor: $6.50 per inch, plus materials, longest rail. 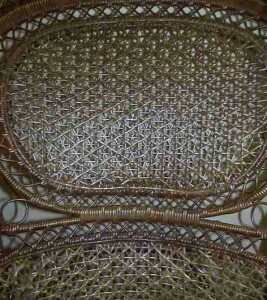 Either L-nail type or side rail seat weaving. 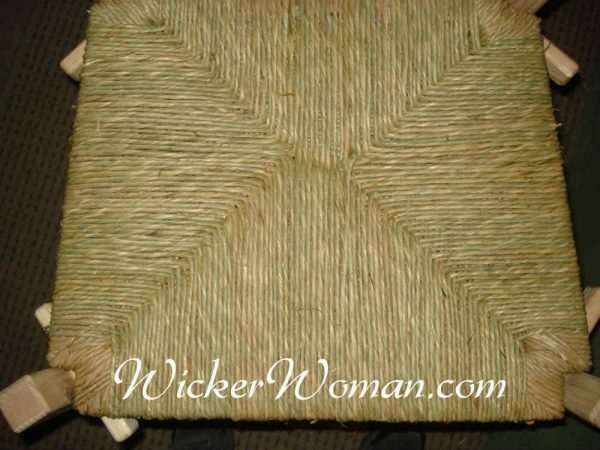 Seats and backs are also sometimes woven using wide binding cane rather than Danish cord, check with me for additional pricing. $5.75 (Hickory Bark), plus material cost. 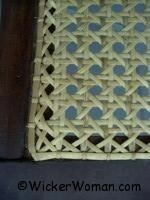 Woven both top and bottom around four seat rungs, usually in a 3×3 or 4×4 twill, but can be other patterns, too. 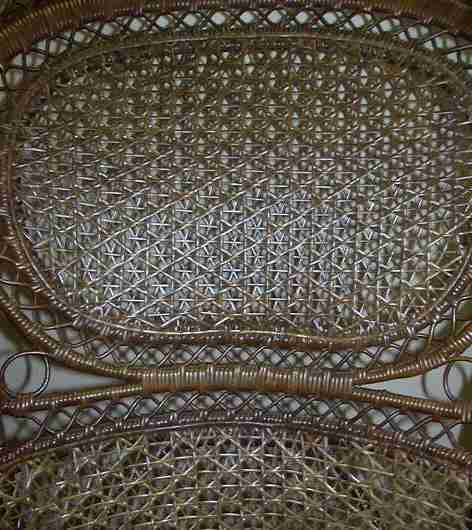 Hickory bark is a seasonal available material and much more costly to obtain than the other weaving materials. 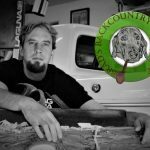 Teaching Class Schedule : For guilds, workshops, and conventions $35-100 per hour instruction, plus individual student material fee, with most expenses negotiable. Take a look at my teaching schedule for this year. 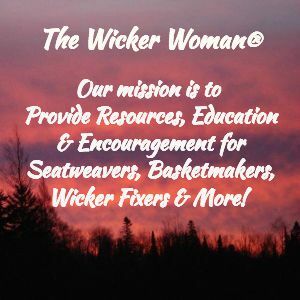 If you have further questions about wicker repair, chair seat weaving, painting, instruction how-to books or want to know how to care for your pieces, go to the Seatweaving FAQ , Wicker FAQ and How-to Articles .